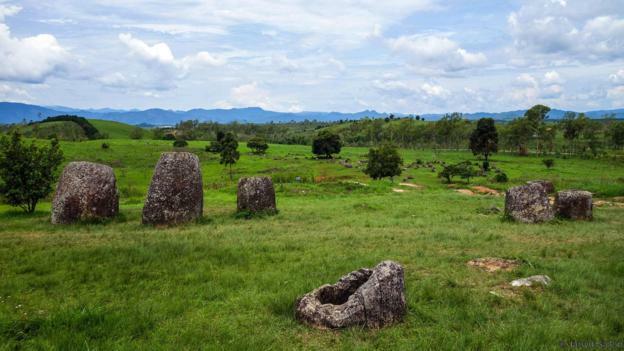 Amid mountains in Laos, a field is home to the Plain of Jars. The massive stone jars—some are almost ten feet tall—are from 2,500 years ago, and no one knows why they’re there. Nearby human bones suggest the jars might have been used for burial or to house decomposing bodies before being cremated or going to another part of the funeral process. Meanwhile, locals say the vessels held whiskey for a mythical giant, or rice wine to celebrate giants helping them defeat enemies. 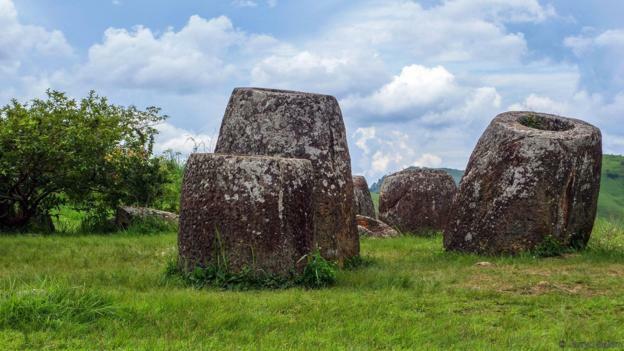 Undetonated U.S. bombs from the Vietnam War are still scattered in the area, so only seven of the 60 Plain of Jars sites are open to the public. Unknown to most travellers, thousands of stone urns dating back to the Iron Age are peppered over hundreds of square kilometres in the mountains surrounding Phonsavan – a lengthy detour from the typical transportation routes. Scattered in seemingly random locations, some reach enormous dimensions – up to 3m tall and 1m wide – and weigh well more than a few metric tonnes. Human bones, stone lids and discs have also been found in the area. What purpose these stone jars served and who constructed them remains a mystery. Due to their size and the nearby bones, some archaeologists think the urns were prehistoric burial sites for an ancient civilisation that travelled along a forgotten overland trade route between the Mekong River and the Gulf of Tonkin. Others believe the urns were used as distilling vessels during the early stages of funeral rites. A body would be placed inside and left to decompose before being moved to a crematorium or secondary storage location. After the corpse had fully decayed, the remains would be returned to the urn and another fresh body would join it, repeating the cycle. This belief is supported by the traditional Southeast Asian mortuary practices used for members of royalty. Thai royals, for example, historically had their bodies cremated many months after death, with their remains being moved from urn to urn until the final day of incineration, in the belief that the soul moves through a gradual transformation, exiting the earth and entering the spiritual world. Additionally, the rims on each jar are thought to have supported lids that would be placed on top until the body decomposed, adding credit to this theory. Locals, on the other hand, have more exciting philosophies. Some say the stone vessels were created to brew potent rice wine to celebrate the victory of a band of mythical giants over their enemies; others say the jars held whisky for a thirsty giant who lived in the mountains above Phonsavan. But the truth is, no one knows the secret behind this ancient mystery.